How many of you asked “when am I ever going to need to know this” in math class? While basic mathematical literacy is essential for life in the modern world, most people can achieve success in their careers if they can’t remember the difference between pi and apple pie. One of the exceptions to this comes from my own career path- scientists absolutely, positively need to have strong quantitative skills in order to perform research. However, many scientists struggle with math. I can’t even count how many conference presentations I’ve attended that included a statement along the lines of “don’t worry about all the complicated equations here”, or how many students or journal club attendees have told me that they just skipped over the section of a paper focusing on models and equations. See what I did there? Can’t even count? Anyway, while math may be more directly relevant to our jobs than it is to some of yours, we still find it hard. This paper clearly got the attention of the theoretical ecology community- one of the most recent issues of PNAS contained not one, but FOUR separate responses to it! That’s almost five times as many as one! See? Unlike some scientists, I can do math. One response claimed that Fawcett and Higginson had misinterpreted their results, and that the lack of citations was attributable to a decline in the scientific community’s interest in math-based theoretical ecology in general. One called for an overhaul in science education with more of a focus on math skills (instead of asking current scientists to explain their equations more clearly). Another points to a few examples of highly-cited math-heavy works as evidence contradicting these conclusions- which is ironic because it relies on anecdotal evidence instead of mathematically rigorous analysis. The backlash against these conclusions is unsurprising. Even if the situation isn’t as severe as indicated by this analysis, it certainly exists. To those who recognize that this is a problem, fear not- Dr. Fawcett and Dr. Higginson have suggestions on how to fix it. This analysis quantifies what we’ve known is a problem for a long time, and it will be fascinating to watch how the scientific community responds. I really hope that scientists work to improve our mathematical literacy as well as our ability to explain the equations so essential to our work. If we continue to ignore the problem, it could multiply- and before you know it, our number will be up. Definitely fault on both sides. When I mention I teach calculus to other biologists, the most common first response is “Oh, I am so bad at math!” But I have also met mathematicians and physicists who cannot or will not bother to explain conceptually what an equation means. Hell, a lot of them won’t even bother defining the variables before whipping on to the next slide in a presentation. Fostering communication is difficult, and most people like to blame the other guy when things don’t work out. Thanks for the invite to comment on the blog. I didn’t expect my letter would generate such a response. I’ll start by saying I think a lot more emphasis should be put on mathematics in undergraduate biology courses. As it stands, maths in biology is very much de-emphasised during this time. At least that’s my experience. So it’s quite a shock when you begin reading papers and find there are numbers beyond those describing what page you’re on. That said, the outlook is good for those who are eager to improve their literacy in maths. The number of resources on-line is ever on the increase. The Khan Academy and coursera are just two sites that come to mind. It helps that you can take these anonymously too. Nobody wants to admit that they’ve forgotten all of their calculus, but online, there’s no one to judge. Of course, there is the problem of finding time to take these courses. Moreover, and as I said in my response, we need to move away from the “paper paradigm”. (This term was used by the authors of the OneZoom project, where they argued for making full advantage of the digital world) Maths should be made interactive. This is why I’m so against dumping the detail in the appendices; it will get overlooked. So, in sum, more integration of maths and biology from day one and abandon the paper paradigm. In my original response to the letter I was trying to make two points. The first was that for some audiences the inclusion of mathematical equations is a positive advantage, people who write papers with equations like reading and citing papers with equations. This was supported by the orginal data. The second is that it is very hard to reach a clear conclusion about causation. For a more general biological audience is it the equations that are off-putting or the type of papers that contain equations? But I think the focus of the discussion here about mathematical literacy in biology in general is the correct one. And I really think literacy is the correct word to use. It took me a long time to see maths as more than symbols on a page and recognising it as a language in which to make arguments. The power of maths as a language comes from the precision where it is imposible to hide ambiguity. Biology is a science of complex systems where we often have a poor understanding of underlying mechanisms and causation. This tension between the precision of maths and the uncertainty of the systems we study sometimes makes it had to see the relevance of maths. So I think the challenge in increasing mathematical literacy is showing relevance but also we may have to accept that more widespread acceptance may depend on our biological understanding advancing. So move the math to an appendix? It’s also possible that the use of complex equations increases the chance that a researcher is overthinking things, or trying to pull a fast one. Most useful equations are locally linear. Is it not possible that there are simply fewer people who are interested in and work in the areas of biology that require complex mathematics for explication as contrasted with the number who are interested in and work in areas that do not? I mean fundamentally interested, as opposed to turned away from because of the mathematics. Fair enough, it is anecdotal to note some maths-heavy papers that are highly cited. However, that demonstrates that equations do not preclude high citation. That is relevant given that the argument that maths reduces citations is based on correlations, as noted in the responses (and above by James Gibbons). The question of causation remains unresolved. 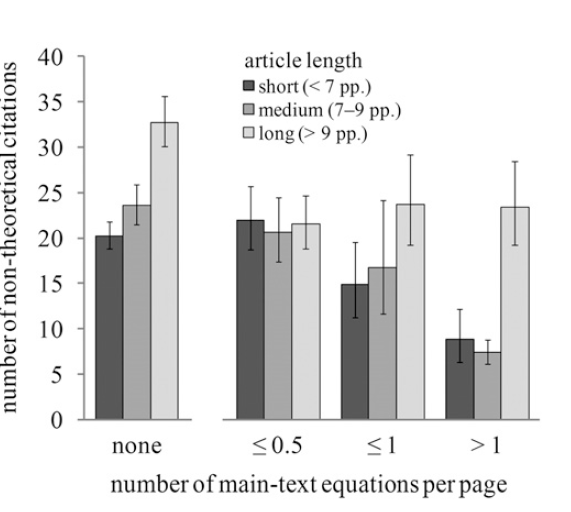 The more profound question is how best to present maths in papers (for understanding, not just citation)? When you’re writing for a highly educated technical audience, it’s fair to assume they can handle mid-level mathematics. We all took calculus, and statistics, right? I’d submit that most people reading are capable of understanding – it’s just that their prior education was lacking (math education in the US stinks) and the don’t want to put in the effort to fix that. I’d say more focus/practice is needed, not less. My experience is that, unfortunately, there are many scientists on the “bio heavy” and “math heavy” sides who simply don’t have time or resources to properly respect each other’s work. On the other hand, I’ve helped biologists who learned, early no, to never ask a statistician ANYTHING because all they ever get told is “you didn’t do it right” or “one of the test tubes tipped over so we can’t analyze your data at all”. C’mon guys… get creative and see how much you can help! Heck… I just had an article rejected from four journals NOT because it was flawed, or because I didn’t support the conclusions enough, or because it wasn’t an important question. No, I was rejected from the biology journal because the article (four tight pages, two tiny, simple equations) had “too much math”. The bioinformatic journal rejected it because “there was too much statistics”. The stats journal rejected it because there was too much biology. And the biostats journal rejected it because “it is not formal enough; we recommend a bioinformatics journal”. And this serves to push the frontiers of science how? I believe the above notes and comments indeed fail to go forward from the paper. The problem is neither how can we make ourselves more facile with complex mathematics, nor how can we excruciatingly explain detail we have a right to expect our colleges capable of comprehending, instead we (like any good reporter) provide information to those who wish to learn in such a way as to facilitate the use of the information. * Many many scientists will read broadly in areas not directly associated with their work or field of study. The gestalt thus derived assists with the leaps occasionally foundational to the progress of our understanding. These readers (though perfectly capable of understanding the detail) are often uninterested in the minutia and indeed can fail to fully read a paper with more challenge than casually sought. * Peer review absolutely requires keen attention to the minutia of process, methods and materials. The community as a whole places great emphasis on the concept that A paper selected for publication must show rigor in these areas. * Authors (few to be fair) often feel that complex equations lend legitimacy or validation to subjective measurements. By placing higher order math where it is not necessary challenges the reviewer to speak against valid mathematics in a technical forum. WHY ARE THE PAPERS WRITTEN ! The answer to this question shows the promise and alignment of the authors data. It is unseemly to suggest that the papers less cited deserve to be less cited because they less clearly communicate material necessary for others to build upon. It is also less than polite to suggest that competent researchers avoid validation of work on which they may depend. I present that the combination of papers written to impress rather than build, and the policies of Journals concerned with image and girth over relevance, are two of the main contributors to the phenomena. These are subjective suggestions and with my limited capability I can present no metric for the community to test this theory. I do however hope that I have correctly placed these words ( in the comment section of a blog which is likely found entertaining by colleges of relevance) so as to inspire others to make the world a better place. Although not my first time commenting I thought it would be morally correct to remind you folks that Alabama BBQ unquestionably sets the standard for excellence. Equations to follow. As long as your cookin’ north of Birmingham, Alabama BBQ is a reasonable approximation of Eastern Carolina, but keep your mayonnaise and mustard off my hog. I’m a biologist who has been invoved in setting up an undergraduate Mathematics-Biology undergraduate research program over a number of years. Our goal was to develop stduesnt with both mathematical and biological ‘intuition’. After collaborating for some time I’m convinced that such things truly exist…and can be developed. I just got back from a UG research conference at the National Institute for Mathematical and Biological Synthesis (NIMBios). It’s interesting and heartening to see the students (mostly juniors) presenting their work. But my strong impression is that math majors are less put off by biological complexity that biology majors are by mathematical complexity. And reading between the lines, their respective mentors in math or biology are setting the tone. Part of the problem is that biologists are taught the wrong kind of math. For example, I took the required three semesters of calculus as an undergraduate. But as useful as calculus is to fields such as engineering, most subfields of biology never need to take the integral or derivative of anything. I never have outside of the classroom, and I’m a computational biologist! What biologists need first and foremost is complete comfort with simple algebra of the type taught in high school (and you’d be surprised how many biology grad students can’t solve a couple of simultaneous linear equations), and second of all statistics. And yes, I know the statisticians will say “but you can’t prove key statistical theorem X without calculus”. This is true, but knowing how to apply statistical methods doesn’t actually require proving how they work despite the beliefs of many statistics professors. Hardin’s “Tragedy of the Commons” is one of the most cited papers of all time. Yet we understate its scholarly impact if we simply tally its citations. John Kenneth Galbraith once defined a “classic” as a work that is cited but never read anymore. Let’s not get too caught up in what citation counts can and cannot tell us. Scholarship directed toward general audiences tends to have fewer equations and to be cited more often. Scholarship directed toward narrower, more specific audiences tends to employ more jargon and equations, and is usually cited less frequently. We need both types of scholarship.